If you know certain details about a task, you can decide whether it makes sense to build a job aid. 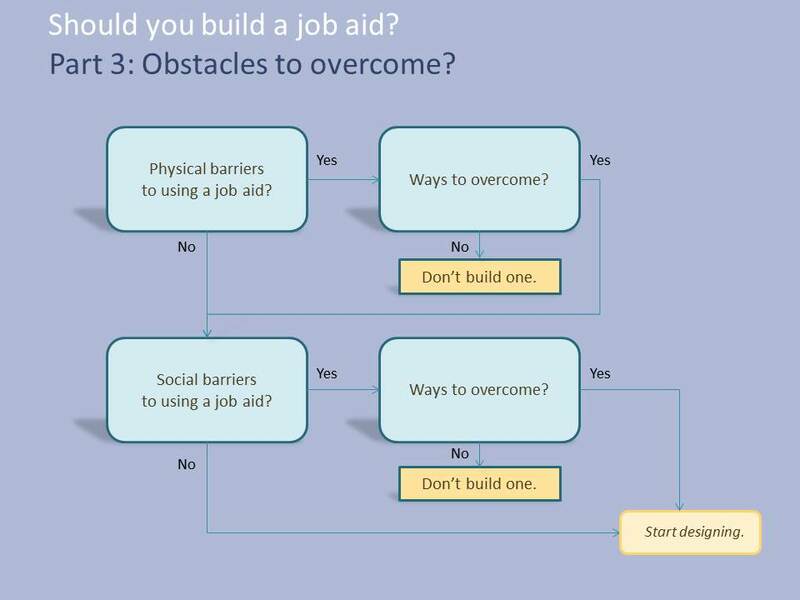 Part 1 of the decision considers whether you have to build a job aid, even if it doesn’t make much sense, and whether certain characteristics tell you that a job aid won’t work. “Is a job aid required?” isn’t as daft as it might seem. If your organization mandates a job aid for some task, then you’re stuck. Unless you convince the right people to reverse the policy, somebody’s going to be building a job aid. If that’s you, you might as well get started, and you don’t need to read the rest of this piece; your decision has been made. Assuming that a job aid isn’t mandatory, the next question is whether speed or rate is a critical factor in performing the task. The short answer is that if speed matters, a job aid isn’t going to work. Many jobs call for you to apply knowledge and skill in quickly, even if not predictably. Think about safely driving a car through a tricky situation, much less an emergency. You don’t have the opportunity to consult a job aid. If a kid on a bike suddenly pulls out in front of you, you can’t look up what to do. The newcomer lacks that fluency. She’ll acquire it with practice, but not via a job aid. The need for speedy performance gets in the way. Likewise for rate–a sustained performance over time. Routinely high-volume work like factory production or air-traffic control doesn’t allow time to consult a job aid. Success depend on learning–on committing skill and knowledge to memory, and on retrieving and applying those things appropriately. I’m a fast typist (80 – 85 words per minute if I’ve been writing a lot), but the moment I glance down at the keyboard, my rate drops. The visual signal interferes with the virtually automatic process I normally use at a keyboard. 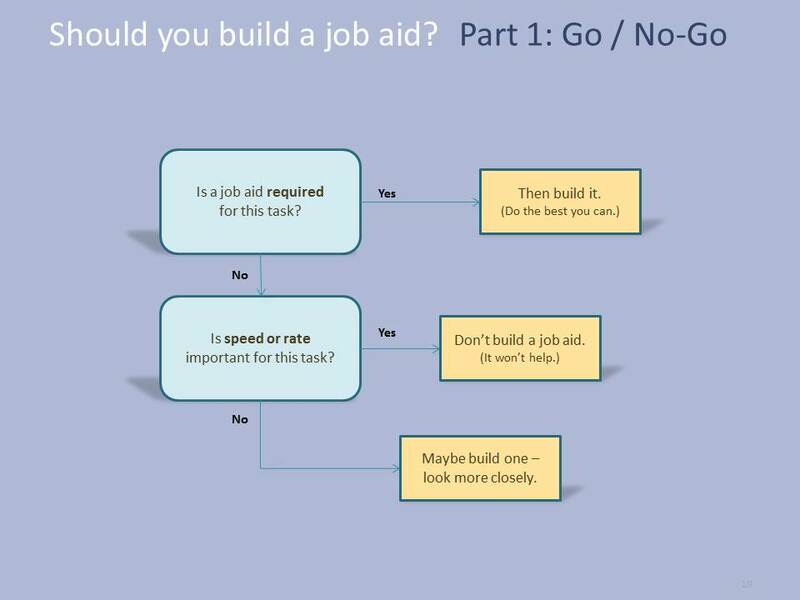 Use what you know about the task to figure out whether building a job aid makes sense. You can go about this in many ways, but the following questions quickly cover a lot of the territory. Some tasks don’t really seem to have steps. Or they have very few: look up the arguments for the HTML <br> tag. And some tasks have so many that it might make sense to break them up into logical subgroups: setting up the thermoformer. Testing the thermoformer. Troubleshooting problems after the test. So, think of “step” as the lowest level of activity that produces a result that makes sense to the performer. If I’m familiar with creating websites, then “create a new domain and assign it to a folder in the \public_html directory” might be two steps, or maybe only one). If I’m not familiar with creating websites, I’m going to need a lot more steps. That makes sense, because a job aid is meant to guide a particular group of performers, and the presumption is that they share some background. If the performers have widely differing backgrounds, you may need two versions of a job aid–see the Famous 5-Minute Install for WordPress and its companion, a set of far more detailed instructions. Essentially, that’s two job aids: the 5-Minute Install for experienced people, and the lengthier details for newcomers. As with frequency, you need to think about how many steps in the tasks are few or many, relatively speaking. For someone who writes a lot and who has solid, basic word processing skills, writing a 25-page report has plenty of steps, but few of them are difficult (other than getting reviewers to finish their work on time). That’s the reason for two step-related considerations in Ask the Task: are there a lot of steps? Are the steps hard? We’re not talking about whether the job aid will change, because we still haven’t figured out if we’re going to build one. We’re talking about the task: What are the odds it’s going to change? “Change” here could include new steps, new standards, new equipment, a new product, and so on. The less frequently someone performs a task, the likelier it is that he’ll forget how to do it. If you’re an independent insurance agent whose practice mostly involves homeowner’s and driver’s insurance, and you write six flood insurance policies a year, you could probably use some task-related support. Job aids don’t forget. The more difficult the steps are, the harder the performer will find it to complete each step appropriately. A job aid can remind the performer of criteria and considerations, and can provide examples. The higher the impact of error, the more important it is for the performer to do the task correctly. You certainly can train people to respond in circumstances like air traffic control, emergency medical response, or power-line maintenance. You do that when the on-the-jb situation (up on a utility pole) or the time-to-perform justify the expense of learning. Otherwise, a well-designed job aid is a good way to help the performer avoid high-cost error. 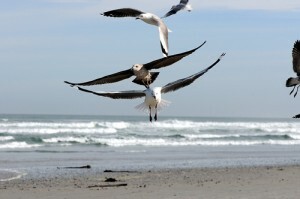 The more changeable the task, the less sense it makes to train to memory. That’s because when the change occurs, you’ll have to redo or otherwise work at altering how people perform. If instead you support the likely-to-change task with job aids, you’re avoiding the additional cost of full training, and you mainly need to replace the outdated job aid with the new one. Is a job aid mandatory? If not, does speed or rate make a job aid unlikely? 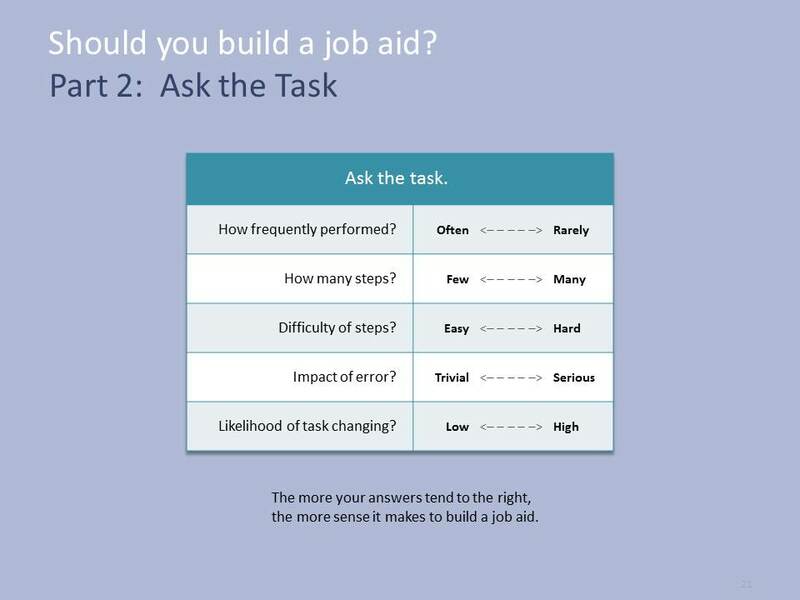 Do the tasks’s characteristics suggest that a job aid makes sense? Getting this far, you might want to leap right into design. But people don’t perform a task within an environment. Part 3 of your decision is to ask if that environment will hamper the use of a job aid. 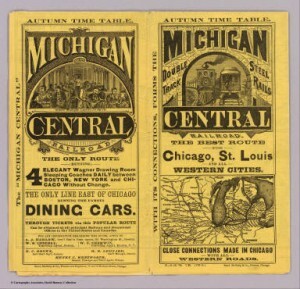 As the narrator points out around the 4:00 mark, in the 19th century a railroader would have to ride each car as gravity moved it down a manmade hill (the hump), applying the brake by hand to keep the car below about 4 miles an hour. It would have been impossible to give the brakeman a job aid for slowing the car, so his training (formal or otherwise) would have required lots of practice and feedback about judging speed. Remember, the goal is not to have people use job aids; the goal is to produce better on-the-job results. Modern railroads rely mainly on computers and sensors to control speed when assembling freight trains, rather than either job aids or training to memory. Another way to overcome physical obstacles to the use of a job aid is by changing the form. No law requires a job aid to be on an 8 1/2 by 11 inch laminated piece of paper. 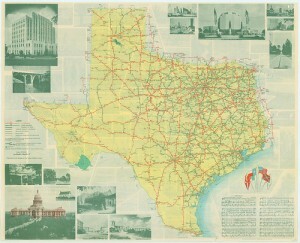 Nor on the formerly ubiquitous, multifolded paper of a highway map. 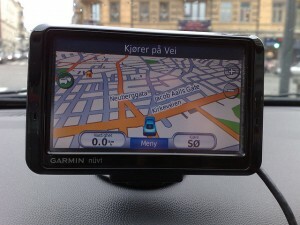 A road map can support different kinds of tasks. You can use it at a table to plan where you’re going to go, to learn about the routes. No barriers to such use. If you’re driving by yourself, though, a paper road map is at best sub-optimal. It’s hard to use the map safely while you’re driving. Popular culture places a great value on appearing to know things. When someone turns to an external reference, we sometimes have an irrational feeling that she doesn’t know what she’s doing–and that she should. In part, I think we confuse retention of isolated facts with deep knowledge, and we think (reasonably enough) that deep knowledge is good. At its worst, though, this becomes the workplace equivalent of Trivial Pursuit. A railroading example might be someone who can tell you not only the trains but the kinds of locomotive that ran on a certain line decades ago–but who can’t issue you a ticket in a prompt, accurate, courteous manner. This bias toward recall may come from the performer herself–she may think it’s better not to “have to” use a job aid. Or coworkers may have that bias–only a rookie need to look things up. Managers and even clients may prefer not to see the performer using a job aid. One path to overcoming is bias is to embed the job aid in a tool or application, such that the performer is merely applying one feature. That’s essentially what a software wizard does. Watch me turn this data into a chart: I just choose what I want as I go along. Joe Harless, from whom I learned a great deal about job aids, gave the example of an injection gun used for immunizations in third-world settings, healthcare workers occasionally had to make adjustments to clear jams and similar equipment glitches. Senior workers did not want to seem to need outside help to maintain their equipment, but couldn’t retain all the steps. (Remember in Part 2? Number of steps in task, complexity of steps?) So the clearing instructions were attached to the equipment in such a way that the worker could follow the job aid while clearing the gun. The job-aid diagrams are mine. This post is based on material that I originally posted on Dave’s Whiteboard.